This is a direct replacement for the OEM Weber piston. It will fit into the original Nicasil cylinder without any modifications. This kit is also compatible with “cast-iron” replacement sleeves. The 8.5-1 compression ratio is for turbocharged MPE-750 engines only. The forged piston has moly coating on the skirt for increased durability. 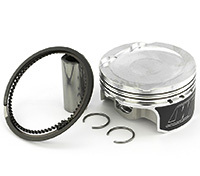 The piston assembly includes rings, circlips & piston pin for one cylinder. (2) Piston kits are required per engine.